Open-plan offices are all the rage. Companies continue to strip away walls, push desks together, and create higher energy environments in the name of fostering face-to-face interaction, but a new article titled “The impact of the ‘open’ workspace on human collaboration” published in the Philosophical Transactions of the Royal Society B: Biological Sciences presents findings that suggest that open office designs might actually reduce in-person interaction. 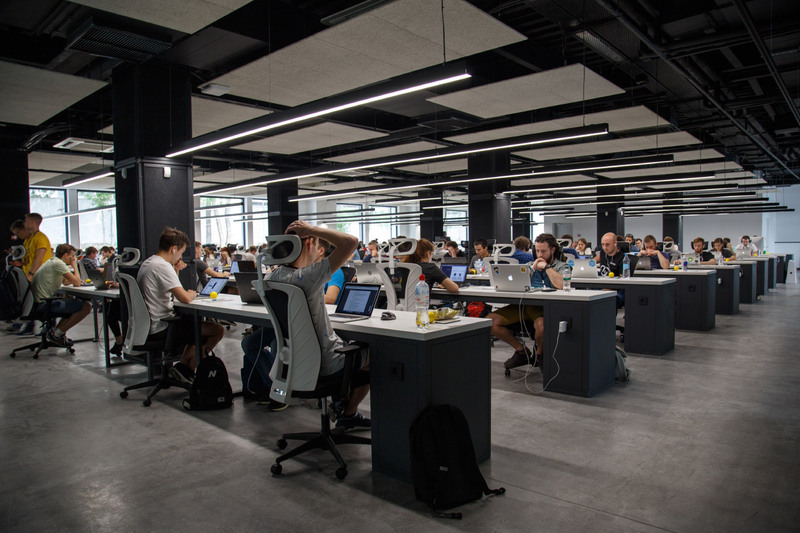 The article reports on a study conducted by Ethan Bernstein and Stephen Turban of Harvard Business School that is the first to quantifiably measure human interaction before and after implementing an open-office floorplan. The researchers tracked productivity among 52 individuals and discovered that taking away physical barriers caused employees to erect their own methods of isolation. The sample population was outfitted with badges that would measure the frequency and length of conversations, and that data was combined with email and instant message tracking. At the end of the 15-day study, researchers had found that employees spent 72 percent less time interacting in person and instead sent 56 percent more emails and 67 percent more instant messages, and that those messages were 75 percent longer on average. The company also reported that overall productivity had decreased after the layout change, which researchers attributed to less information being conveyed over email than in person. This dramatic change in interaction patterns was attributed to employees’ increased visibility and lack of privacy. Once coworkers were able to see each other’s screens and more easily overhear conversations, they reportedly wore headphones more, cutting down on approachability, and tried to look busy at their computers, which meant sending more emails. Ultimately, the report found that the projected increases in productivity and promised spontaneous meetings ran up against the fundamental human need for privacy. Researchers also cautioned that while removing barriers would seem like an intuitive way to have employees engage with each other, mandated social interaction was much less efficient than occasional meetings. The downsides of designing office- and barrier-free workplaces, other than the acoustic challenges, aren’t new. AN questioned the trend in 2013 after a series of articles raised concerns that the privacy-communication tradeoff wasn’t working in employees’ favor. A growing number of workers are also searching for quieter environs and wellness spaces outside of the office. While it’s unlikely that this report will be the final nail in the coffin of trendy industrial workplaces with rows of undifferentiated benching, it may help architects and interior designers keep privacy in mind when designing these spaces in the future.